Iron golems are not as strong as you would like and to battle with a serious boss you need an army of golems. The Alex's Guardian addon was created in order to get a really powerful guard capable of killing any hostile mob. It will be logical to compare the new golem with its descendant with an iron golem. 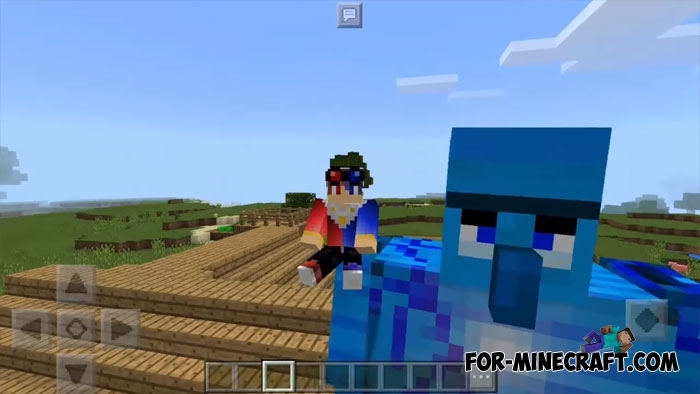 The blue golem is several times bigger and stronger than the previous one, and also you can sit on its shoulder. Riding it is possible only in arbitrary directions, so the player can not control the golem, but there is the possibility of using the bow during the movement. These golems as before spawn in villages and protect villagers. In order not to look for these huge creatures, you can easily build a small sculpture for the summoning (4 iron blocks and pumpkin). The health of the golem allows one to live for a very long time and to defeat whole crowds of opponents. If your house is constantly besieged by villains, then Alex's Guardian will be able to help you at any time.